Gul Ahmed Winter Dresses for Women. Gul Ahmed Chiffon Shalwar Kameez Suits 2014-2015 with Beautiful Printed Neck Designs & Pashmina Woolen Catalogue. These Gul Ahmed Chiffon Shalwar Kameez Suits beautiful with print work done by designers. Gul Ahmed is the most famous name in Pakistan Fashion Industry. First of all i will talk about the Gul Ahmed as a Fashion House of Pakistan. The Gul Ahmed Group is the most famous business group in Pakistan. It began trading in textiles in the early 20th century in Pakistan.Gul Ahmed group decided to inter in the field of fashion world in 1953 and registered in the name of Gul Ahmed Textile Mills Limited. In 1972, it was listed on the Karachi Stock Exchange. Since then, the company has made rapid progress and is currently one of the top leading composite textile houses in the world. Ideas by Gul Ahmed is the retail venture of Gul Ahmed Textile Mills. Considering the growing trend towards the retail industry in Pakistan, as well as the increase in cotton prices and the need to focus more on value-added products, the company decided to diversify into the country’s retail sector in 2003. Ideas by Gul Ahmed offers women dresses, men clothing, kids apparel and furnishings for the bedroom, kitchen and bathroom. It also provides in-house monogramming, embroidery and tailor-made services. Gul Ahmed Fall/Winter Collection 2014 2015 is launched by the company in beautiful and bright colors. First of all i will talk about the collection. Well, this time Gul Ahmed showcased long kameez with shalwar. Gul Ahmed Designers done a awesome work on this chiffon dresses collection. The printed work done on this Winter Collection is very gorgeous. Long kameez have a beautiful printed neck designs. Gul Ahmed Winter Dresses also include La Chiffon and Pashmina Woolen Dresses. You can also see this print work on the borders of the kameez and sleeves. Gul Ahmed Designers used bright and dark colors combinations in this chiffon dresses for winter. The main colors are blue, black, pink, orange, red, brown, purple and many others. The price range of these dresses are also affordable. Price range are from 5,000 to 6,500 rupees per shalwar kameez suit. 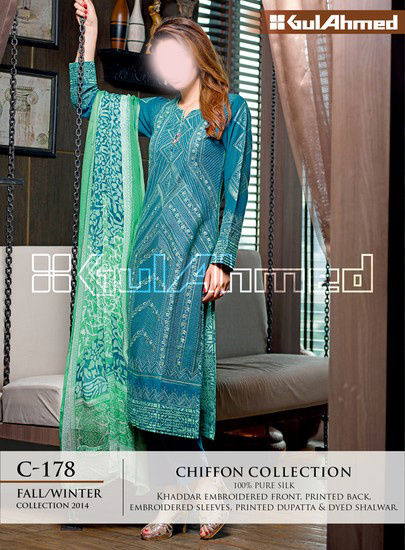 Following is the latest pictures from Gul Ahmed Winter Dresses Catalogue. Gul Ahmed also published this images on facebook. gulahmed p37 pashmina woolen collection suit ki price kya hy?